The goal of this POW is to place a sprinkler between 3 planted flowers and find out how to place a sprinkler in the middle of the 3 flowers so they all get watered. To solve this POW I started by drawing flowers on the table and figuring out where the sprinkler could be to put the same amount of water on all the flowers. I drew triangles and put the flowers on the corner of the triangle and then would draw a sprinkler in the center. It worked for the first one and I found the sprinkler can be put on the bisector of the three flowers so all flowers are perpendicular to the sprinkler and bisector. 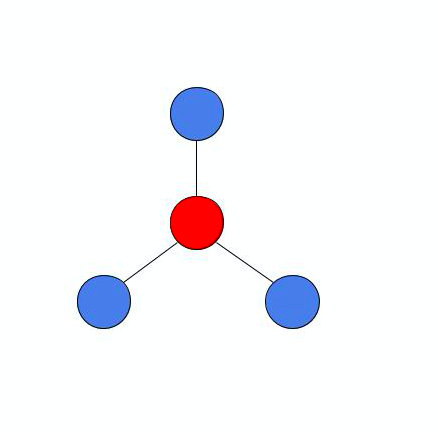 My solution is that the flowers have to be placed evenly around the sprinkler on the perpendicular bisector or have the flowers arced around the sprinkler on an even curve. I thought this was a good POW. It was confusing at first because I wasn’t sure what my answer would be at all. I did not know how to explain what axis or bisectors the sprinkler would be on. After drawing it out I realized how to do it and thought it was not too hard to solve once understood. I think that I did a good job on this POW. I solved it and wrote out all necessary explanations. I also made a clear, color coded visual representation. I think I deserve an A because I met all requirements and solved the problem correctly or explained why if not. ​How did you like doing your independent research project? I enjoyed doing my independent research project because I was able to choose any topic I wanted that related to math. It was fun to choose doing patterns and work with photoshop to make my fractal art. I liked the projects we did this year but there was a lot of workbook work that doesn't interest me as much and I have a hard time motivating myself to do it. It would have been nice to have more time to work on the final project but we still had enough time to make a cool project. If I were to change this project in the future I would give more time so we could make a really cool project. While researching this topic I learned more about the math behind fractals and what exactly they are. It was also cool to look at other album covers and realize how many have fractals incorporated into them. ​If you set goals for yourself this year in Math class, were they achieved? Why or why not? The goals I set this year in math class were to have a good grade in math. I figured if i do the work to get a good grade then I will learn the necessary content. This was my main goal because I missed a lot of school and I knew as long as I could turn in everything I wouldn't get behind. I feel more confident in my math abilities because I learned a few different equations and methods that I hadn't learned before. This just expanded my knowledge of different types of math. I thought this class was a good difficulty to balance with all my other classes. We never had an excessive amount of homework and I was always able to get extensions when they were needed. I feel that I should be prepared for math 4 next year. I might forget a lot of the work we did this year because there were lessons out of workbooks which I have a hard time remembering how to do those. I hope in the future we will have more project based outside the box math methods because when the way we solve it is interesting then I will be able to remember it a lot better. If there is a game that the way you plays by each time the king goes around and says “you're in” and then “you're out” to every night around the table. The goal is the last person at the table wins and gets to go on an adventure or gets a prize. This is an example of how the chairs and table would be set up in the game King Arthur played. To solve this problem I started by drawing tables like the one above with different numbers of chairs. Then, I would do the process that King Arthur did and see what chair is the one you should choose to win the game. As I did this I wrote down the numbers to see if I could find some sort of pattern. I did this up to about 7 and could not see any pattern. I continued to higher numbers of chairs and started to see a pattern but there was one part where the pattern would reset that I could not understand. I talked to a few peers and looked over the problem together and we found something. As we had first seen, the numbers were increasing by 2 and then resetting at a certain point and someone noticed that the place the pattern reset was powers of 2. I knew this much but it still took a minute to figure out what chair you needed to sit in once the number got pretty high. While looking over it with my peers we found an equation that works and can be done in your head very quickly. The pattern you must know to win the game every time is that with knowing the number of chairs in the room you choose is X - (2y) x 2 + 1. X being the number of chairs in the room, Y being the highest power of 2 that does not get higher than X. If you take the number of chairs in the room for example 18, you take the highest power of 2 which would be 16, subtract them and get 2. Next, multiply that by 2 and get 4, add 1 and you are left with 5 therefore with 18 chairs you will win by sitting in chair 5. I really really liked this problem because the part of math that I really enjoy is when it can be looked at as a puzzle. At first I was really confused with the question but once I understood how I was supposed to solve it I started to like it. It was entertaining guessing through the different ways that we could find an equation and trying different things to see if it worked. I also liked how because of the way this pow was made it seemed like a good accomplishment to solve it. I think that I deserve an A or low A on this POW because I both answered all the questions and got what I think is the right answer. My process was a little bit confusing but I still explained how I came by my answer. The goal of this POW was to build 2 formulas that would both determine the height of the tallest platform if each increased by the same amount and to figure out the total height of all the platforms. To solve the problem I started by working on formula 1. I thought about how if each platform increased by the same amount the tallest one would be the height of platform 1 multiplied by the amount of platforms. This was a pretty simple equation to solve and I did not have much trial and error. For problem 2 I began by guessing and checking different formulas that seemed like possibilities. I found that there was no easy way to solve the second one and that I would have to think of a way to add up each platform while each one is X amount higher than the other. In the end after writing out the problem and guessing with a few peers in class we came to the conclusion that YX+0.5ZX squared-.5ZX should do the trick. We tested this formula with a few different numbers to make sure and came to the conclusion that it is the right answer. 1. The height of the tallest platform can be found by converting the amount of platforms to feet because each platform will be 1 foot higher than the previous one. I found this by trying over and over and getting help from and working together with some peers. I think this answer works because if you take the height of the shortest platform and add it to the amount of platforms-1 then multiply that by the difference between each platform. I think that this POW was worth doing because it took a lot of critical thinking and helped me to better understand how to create formulas. This was not the first POW we had to create a formula in but it was the most confusing and I feel took the most effort. Although I was confused throughout the entire process of building a second formula in the end I understood what to solve. I think that i deserve a B+ on this POW because although it was very confusing I think I solved the problem correctly. I used a lot of guess and check to determine the formulas and did need some help from peers but I am pretty sure they are correct. I am most proud of these POW’s because they are the ones that to me made the most sense and I think I did the best job with the writeup and visual representation. These pows were enjoyable for me because I think of POW’s as puzzles. When the problem I am trying to solve is just turning some numbers to other numbers I do not like math but when the problem is in the form of a puzzle and the answer has a purpose then math is fun for me. As a class we traveled to Silverton, Colorado on October 12th from 11:30am to 2:30pm to test the pH, conductivity, turbidity, temperature, and streamflow of Cement Creek, Mineral Creek, and the Upper Animas. Using the data collected our goal is to make a prediction of those characteristics for the Animas River after the confluence. For our project we went to Silverton and studied Cement Creek, Mineral Creek, and the upper Animas that contribute to Animas River. Our goal was to use this data and make an estimate about the river below the confluence of the three streams and then compare it to the Colorado data. We are doing this investigation to find the conductivity (amount of positive and negative ions) , pH (potential Hydrogen), turbidity (cloudiness of a fluid) , temperature (the degree of the intensity of heat), and streamflow (cubic feet per second of water). After collecting the data we used standard deviation (how spread out data is), weighted average (the percentage each data set contributes to the total), mean (average), median (the data set exactly in the middle) , range (max-min), maximum (the highest data point), minimum (lowest data point) to form conclusions for the Animas River after the confluence. Here are graphs made from our data recorded in Silverton to show the measurements made in each creek. Starting with pH down to turbidity you can see how the different characteristics in the streams can vary a lot. Average pH of all the streams. Average Conductivity of all streams. Average of temperature in each stream. Average streamflow of each stream. Average turbidity of each stream. To collect the data we used the Vernier LabQuest 2, pH probe, turbidity sensor, measuring tape with bobber, conductivity probe, streamflow propeller, and thermometer probe. In order to test pH we calibrated the Labquest with buffer solution yellow pH 7 and buffer solution blue pH 10 then placed the probe into the different creeks. After the turbidity sensor was calibrated, we collected samples of the creeks and placed the vials into the sensor. To measure the streamflow in cfs (cubic feet per second) of the water there were two test options. First, you could measure out a length using a measuring tape and place a bobber at the beginning. Then, time how long it takes for the bobber to float the decided length do it multiple times and find the average. The second way to measure the cfs of water was to stick a propeller stick into the water and The LabQuest 2 will calculate it for you. Furthermore, to measure the temperature you simply stick the probe into the water and the LabQuest 2 will read the temperatures. Lastly, you must calibrate the LabQuest for conductivity by placing the probe into two different liquids one with a low conductivity (potassium chloride 150 us/cm) and a liquid with a medium conductivity (potassium chloride 1413 us/cm). Once, it is calibrated you can place the probe into the the creeks and the LabQuest will read it. We used this approach on pH, conductivity, and turbidity. The first time we did these calculations our percentages for the weighted averages were incorrect. The errors took place due to faulty rounding. We calculated the Upper Animas as 26%, Cement Creek as 25%, and Mineral Creek as 49%. While going over calculation we deduce it was impossible for the Upper Animas to be a larger percentage while it had a lower cfs. After discovering this, we redid our calculations and came to the conclusions: Cement Creek is 26%, Mineral Creek is 50%, and the Upper Animas is 24%. From there, we used the new percentages to recalculate our predictions using the weighted average method. Weighted Average, Finding the average with a weighted scale of importance for each number. All the river/creek beds were stained with a rusty-tinge because of the build up of harsh minerals. We decided to use weighted average because each creeks’ streamflow varied. It would not make sense to just average all the creeks data together because the larger creek have more of an impact on the combination. For example, if you had blue and yellow food coloring and put four drops of blue in water and only one yellow. The color of the water would be closer to blue because you had more of it. The blue impacted the results (color) more than the yellow. This is the same with the creeks because the larger streams affect the combination (Animas after the confluence) more. After using weighted averages to make our predictions we compared our data to the USGS (United States Geological Survey) data and found a mistake. Our weighted average and percentages were incorrect we switched the percentages for Cement Creek and the Upper Animas. After we fixed them, we compared to USGS data again and found that our results closely related to that of their water testing facility. Furthermore, when we were comparing our results with the USGS, we came across the an issue. The the days we tested it froze and the conductivity, pH, and turbidity sensor froze. We decided to corroborate our data with the results of week before's data and were very similar. The temperature was around 6° C at noon we concluded it was around 7° C. This was most likely because our class tested during the morning and afternoon and the temperature of the creeks warm in the afternoon. The streamflow level was around 102 cfs we calculated it to be 100.8. The conductivity sensor was frozen, therefore we compared our results to data trends from days prior. The USGS reported it to be around 530, we calculated it to be 545.04. This makes sense because the conductivity has been increasing steadily daily. Moving to pH, they demonstrated pH as around 6.6 and we calculated 6.03. Based on historical data, this checks out because the measured pH fluctuates from about 6.6 to 6.3. Finally we calculated turbidity as 13.8. Historical turbidity level’s ranged from 5 to 20 with sporadic spike. These variations are most likely linked to the EPA’s upstream water treatment plant’s work. The consistency of results is measured in central tendency. This means how close the averages of your results are compared to both your own other tests and the ones done by other students. To decide if our results were accurate we compared them to all of the results taken in the day and removed outliers, any numbers that deviated from the central tendency. We removed all the negative turbidites because you can not have negative turbidity. Moreover, we removed Charlie and Katherine's measured conductivity because the other data collectors found it to be around 300 and there’s was an extreme outlier. I thought that this experiment was very helpful because it helped us understand our local environment and how our water is effected upstream by Silverton mines. It was interesting when we went up and talked to the guy near the Gold King Mine and I was able to better understand what happened during the spill a few years ago. My favorite part of this field trip was using all the different tools to find pH, temperature, conductivity etc. I thought this was cool because except for the thermometer I have never used those types of tools. The process of calibrating the instruments was very interesting to me too. Learning the process on how to calibrate the tools and then using them all in our project to get our results as accurate as possible was good and made the trip to Silverton worthwhile. Conducting these experiments are important because it is essential for people to have an understanding about the environment. The results from these tests come together to create the overall water quality. Furthermore, water quality is one of the key indicators of the overall health of an ecosystem because animals feed off of aquatic life, plants use the water to grow, and water from the river seeps into the ground affecting the soil. After conducting these tests in our own rivers it can be concluded our state's history with mining is affecting the present environment. The rivers and creeks near the mining district of La Plata County are inhabitable, thus creating an imbalance in the ecosystem. In order to protect and revive our rivers we must install limestone treatment plants to balance out the pH of the water coming from these mines. As members of the Animas River Basin Community we must partner with organizations and stakeholders to ensure clean water for future generations. As a group we deserve an A. We collaborated effectively by sharing the workload evenly. To start, we assigned each other different sections to write. In order to create tangible pieces for each partner to complete. Additionally, we effectively used our time in class and outside of class to complete this lab. Furthermore, we asked each other clarifying questions to ensure we had a deep understanding of the topic. I think that this semester in math I did meet my goals and the main one being to keep a good grade in that class. For most of the semester it was going from an A to a B and back and forth and although the year is not over I currently have an A- and I hope to keep this at an A to finish off the semester so I feel I met my main goal. I think that most topics we learned about I understand and can remember but the work done over the final month of school I did not really understand and although I was able to understand it to the point of completing my work I don’t think I will remember how to do it next year. I think the main reason for this was that it was a lot of content and our homework as filling out worksheets and turning them in. Personally this teaches me almost nothing because until I talk through the process and have time to practice without having to turn in 20 of such problems the next day I will understand but not retain for the future any of the content. I don’t think that the semester changed me as a person very much only I became more practiced at getting my homework done wich I guess is an important skill. Next semester there are two things that I really hope to accomplish. The first being the same as this semester and get a good grade in my class. The other being to get a better understanding of what we are learning and hopefully improving my test scores and learning things that I will both need in the future and remember it when it’s needed.